Holocaust Survivors: Photo Gallery - "Vilna Partisans"
A group of partisans of the FPO in Vilna on the day of the city's liberation. Members of the Nekama (Revenge) group are present. 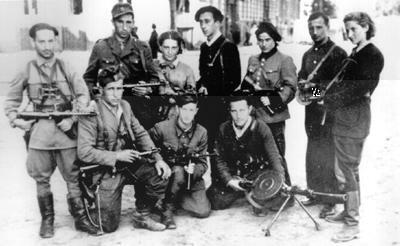 Pictured standing form the left are Elkhanan Magid, Jacob Prener, Bluma Markowicz (who was killed in a bombardment a few days after this photo was taken), Abba Kovner, Ruszka Korczak, Leib Sapirsztein and Vitka Kemper Kovner. Kneeling are Gerszan Griner, Pesach Mizerec and Motl Szames.